Celebrating Diversity and Community at Burgburst 2017 | The Gettysburgian. 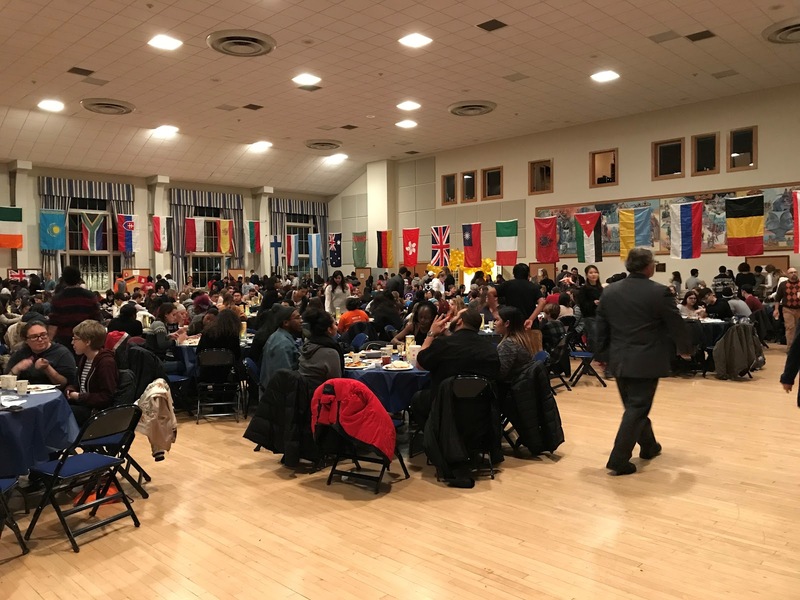 On Saturday, students and faculty, along with their family and friends, gathered in the CUB Ballroom for Burgburst, an annual celebration of cultural diversity and the multicultural community at Gettysburg. Decorated with flags and a global theme, the ballroom was bustling with attendees, searching for seats at the packed tables and joining the impressive lines at the food stations. Nine different stations stood around the room and offered cuisine from a variety of regions and countries, from the Middle East to Germany to China to Australia. At the table run by the Latin American Students’ Association, students served empanadas and platanos, among other dishes, while the Black Student Union offered soul food, an African American food tradition, which included collard greens and candied yams. Attendees found the Korean pancake, kimbap, and mandu at the Korean table and five different kinds of sushi, from vegetarian to Alaskan salmon, at the Japanese table. Jose Martinez ’19, who was at the LASA station, expressed the popular opinion that “trying different kinds of food” was his favorite part of Burgburst. At the Gettysburg African Student Association’s station, Aisosa Ede-Osifo ’20 agreed with Martinez and said that she grabbed naan from the Nepali-Indian food station at least six times. “You feel like you’re visiting different countries,” Ede-Osifo said. She also explained the fun of sitting with friends after traveling around the room and asking what each person found to eat. Certainly, the members of the Gettysburg community present at the event fueled the excitement and energy throughout the space. Israel enjoyed the Korean, LASA, and Vietnamese tables particularly, while Andeulazia Hughes-Murdock ’18 favored the GASA and Chinese tables. As attendees settled in their seats with their plates full of culturally-diverse dishes, the performance section of Burgburst began. Brad Lancaster, Director of International Student Services, began this part of the event by introducing Irene Mugeni ’21 and Vuochnear Ly ’20, who spoke about the charity (SHE-CAN) that will receive the proceeds from Burgburst 2017. SHE-CAN, or Supporting Her Education Changes a Nation, helps women from post-conflict countries to achieve a college education and to become leaders and “change agents” in their countries. Currently, the organization aids women in Rwanda and Cambodia. Both Mugeni, from Rwanda, and Ly, from Cambodia, are SHE-CAN scholars. After their speeches, the event turned over to the evening’s emcees: Mariam Traore ’21 and Hannah Dalzell ’20. With their energetic and fun banter, the pair introduced the audience to the various acts and filled breaks between performances with jokes and stories. Traore and Dalzell first announced the catwalk, in which students and flags from the countries represented at Gettysburg College strutted across the stage. 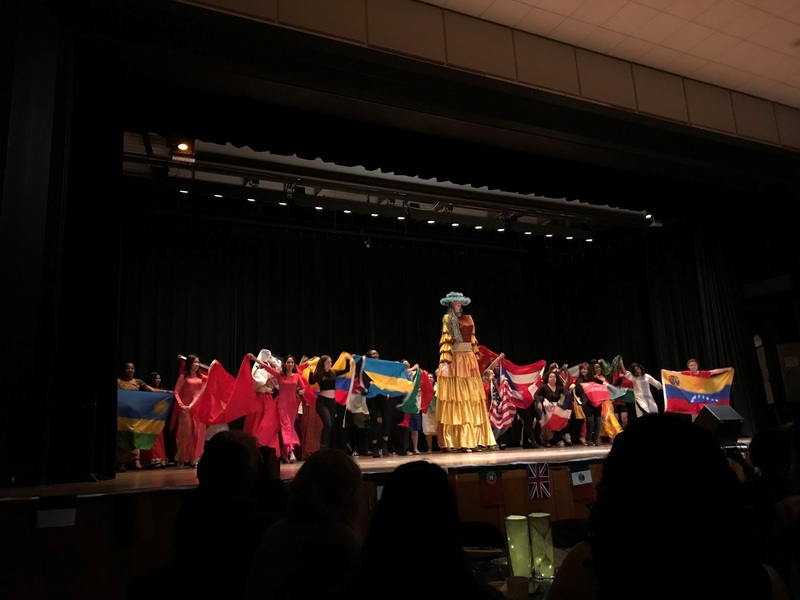 Beginning with Afghanistan and ending with Vietnam, these countries and their cultures were also expressed through the attire of many of the students on stage. Even La Gigantona, the traditional Nicaraguan tall woman figure, made an appearance and danced on stage to represent the Gettysburg students from her country. Following the catwalk was the student performances, which included singing (both with accompaniment and a cappella), playing instruments, beatboxing, dancing (including a sword dance and Bollywood dancing), and spoken word. Lancaster joined the student performers on stage and even surprised the audience with his rendition of “Backpack Kid” from Katy Perry’s “Swish Swish” performance on SNL. The evening’s showcase concluded after exciting choreography by the Bomb Squad. Throughout the performances, the audience cheered and snapped, swayed cell-phone lights, clapped to the rhythm, felt moved by meaningful songs and powerful words, and were amazed by talented musical ability and impressive dance moves. After some final words by the emcees, Lancaster wrapped up the event and encouraged the audience to return for more food, performances, and celebrations of cultural diversity at Burgburst 2018.